When looking at any draft class in NFL history, there are hits and misses, just like in any sport’s amateur selection process. You can’t get it right all the time, and you’re bound to miss on a few players whether that’s for reasons outside of a team’s control or not. One thing is for sure though, and that is that teams should certainly understand the proverbial ceiling and floor for any and every prospect that crosses their eye. The term bust as a professional football player is inherently slapped on players who were drafted higher than they should have likely been in the first place, and that’s where the understanding of how well a player should be able to perform comes into play. While that’s not the question at hand that we’re answering today, it’s still important to note that the following boom-or-bust players could likely be labeled as such, as rumors continue to swirl about their current draft placement. These players have shown, at times, high-level play that would warrant a high draft pick. They have also been known to produce below-average grades and therefore should be approached with caution. These guys can blow up and help win some games, or they could fizzle out and get thrown into the too-oft-used ‘bust’ category just as easily. Sweat is battle tested, and he recorded multiple pressures in every game in 2018. However, it was against the stiffer competition that he seemed to lose his prowess. In games against LSU, Texas A&M, Alabama, and Iowa, he managed game grades lower than 73.2, including pass-rushing grades in the 60.0s, and only brought in a total of 12 pressures on 95 pass-rushes. He took the ‘next step’ in Year 4 with the Bulldogs, reaching career-highs in overall grade, run-defense grade, and pass-rush grade, but played just 458 snaps his final season in Starkville. He can win with power and with speed, but with 962 career snaps played, he played just 58 fewer snaps than Nick Bosa and didn’t come close to his production. He could just as easily have been a flash-in-the-pan during the 2018 season, or he could have just reached the start to his potential last season, and that’s something to be strongly considered. Lock may have perhaps the best pure arm in the entire class, something he has put on display since his days at Lee’s Summit and carried on through all four years at Missouri. He put up gaudy numbers in 2017, throwing for 44 touchdowns and 3,958 yards, averaging a 12.2 depth of target while still completing passes at nearly 60.0%. Last season saw him circle back down to the mean in terms of touchdowns (28) and average depth of target (9.3), and while he threw fewer touchdowns, he actually had a much better year in terms of overall grade and care with the football. His boom-or-bust nature in 2017 saw him toss 14 turnover-worthy passes compared to just six in 2018. His adjusted completion percentage of 71.5% ranked just 60th in the country in 2017 while he raised that to 73.9% in 2018, good enough for 34th. He was aided by the Missouri scheme and play-calling, and if he’s forced to push the ball downfield in the NFL, we could see more of the 2017 version rather than see him take care of it and keep his offense in front of the chains as he did in 2018. 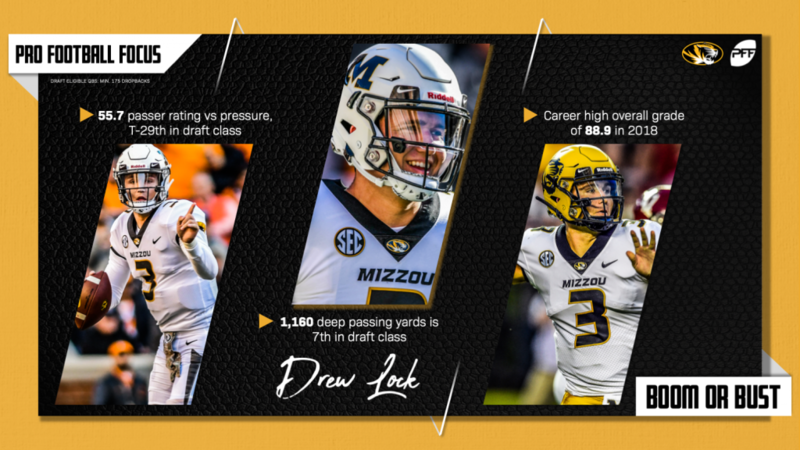 Lock did improve in each year while at Missouri so the question presents itself naturally: Did he reach his maxed potential in 2018, or is he still going to continue to improve? 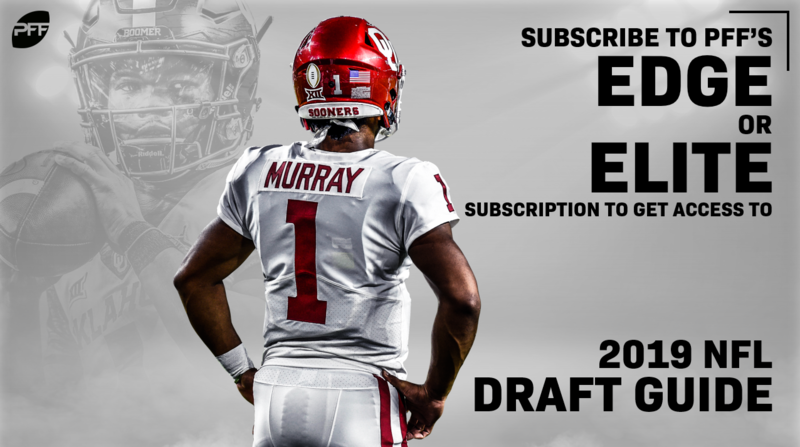 With the market value on quarterbacks at an all-time high, his draft stock will likely be dependent on the latter of the above options, and as such, if he doesn’t continue to improve, he’ll easily be tapped as a bust. Williams’ 2017 season was absolutely brilliant. He limited receivers in his coverage nearly better than anyone else in the country, allowing a ridiculously low 19.4 passer rating into his coverage. In 2018, he came back down to life a bit but was still efficient in coverage. Still, Greedy was beaten more than he was in 2017 and put forth some shaky coverage grades against even lesser competition that all went into his overall grade dropping off quite a bit. A player with only two years of grades and data that went from elite to just above average in the wrong career trajectory should be the definition boom-or-bust. Williams has shown that he can look like a true lockdown cornerback, but he has also shown that he can be out of position almost just as easily. No prospect is ever perfect, but in order to warrant a high draft pick, you’d expect the career grade path to be trending upwards. Metcalf wowed scouts and those watching the 2019 NFL Scouting Combine with his athleticism. Still, Metcalf’s strong performance in the so-called testing at the combine shouldn’t outweigh his production on the field. 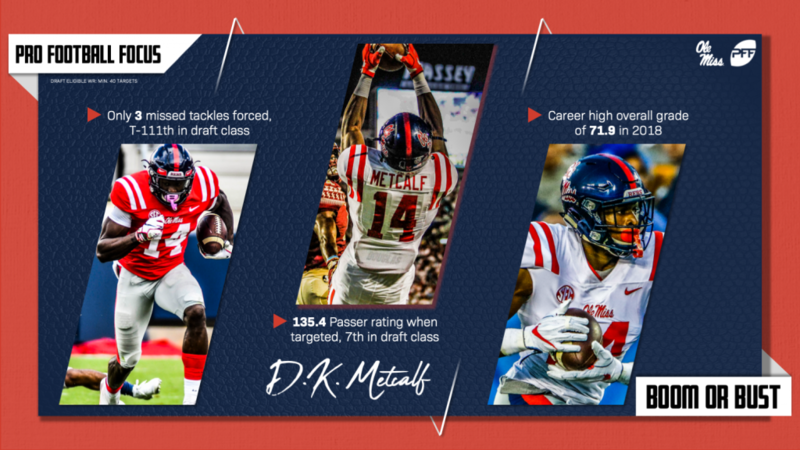 Through three seasons at Ole Miss, Metcalf managed a career-high grade of 71.9 and played just 1,070 snaps, with 692 of them coming in 2017 alone. He can run right by defenders and plays violent at the catch point, as noticed by his draft-class-best grade on ‘off-target’ throws, but he still managed seven drops on 74 catchable career targets. There is no question the skills are there to make him a top-notch receiver, but the fact remains: he has never shown that ability when the results actually matter. Detailed at length by our very own Steve Palazzolo, Gary is not a first-round talent and his production on the field showcases that. Yet, there are still some that believe he warrants a place among the top 32 picks of the draft in April, while we argue here that he’s a Day 2 consideration at best. What Gary does have going for him is his incredible athleticism. Athletes have gone far on athleticism alone, but you’re not long for the league if you can’t back up athleticism with production. And that’s where Gary is lacking. On 717 career pass-rush attempts, he managed 100 total pressures, and half of those came from the 2017 season alone. Gary’s best pass-rushing season of 2017 doesn’t even crack the top 10 of pass-rushing seasons at Michigan since 2014, let alone the 2019 draft class at edge defender. With the proper scheme and utilization, there is no doubt Gary’s athleticism can carry him to success, but if misused or wrongly utilized, he could be just another example of combine and athletic testing studs that doesn’t pan out.